Thank you to Dremel for providing me with products to facilitate my blog review. All opinions are 100% my own. Today I want to tell you about my new favorite tool, the Dremel 4300. 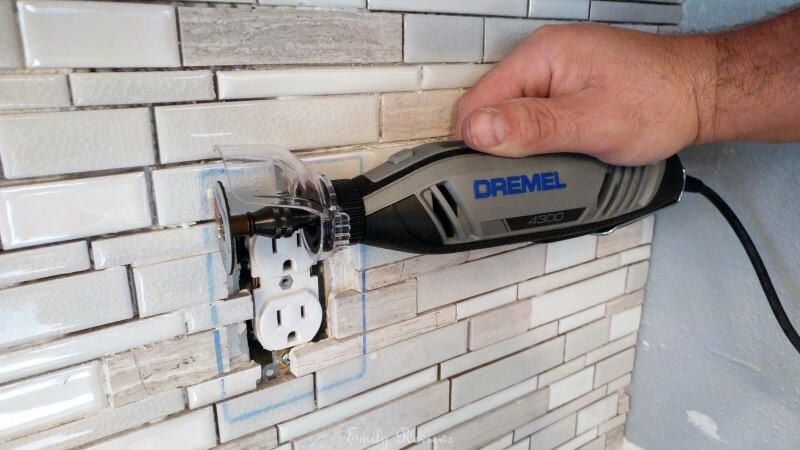 Dremel 4300-5/40 High-Performance Rotary Tool Kit is perfect for all of your DIY projects. The Dremel 4300 comes with a Universal 3-Jaw Chuck, 5 Attachments, and 40 Accessories! 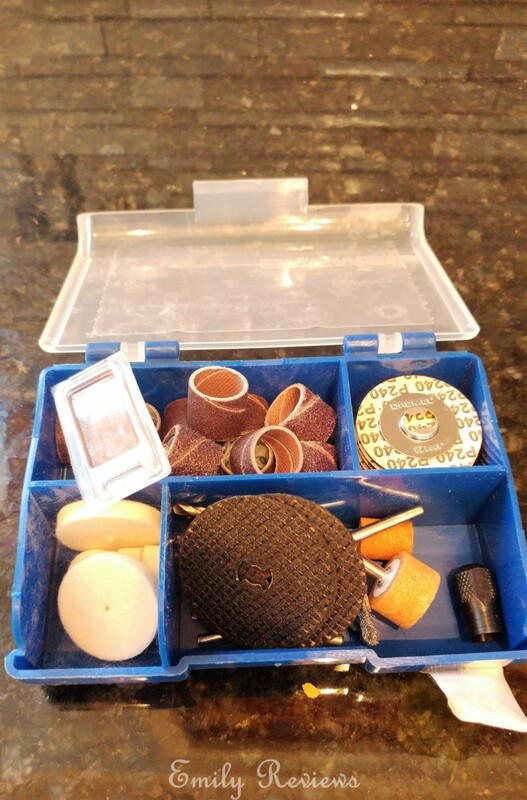 Whether you are cutting, grinding, sanding, or polishing, the Dremel 4300 will help you get the job done.When you are in between projects, the Dremel 4300 and all of its accessories can be safely stored in the convenient carrying case. If you follow my posts regularly or even semi-regularly then you probably know we have been working on renovating our kitchen for the last five months. We have removed wallpapers, painted, replaced vinyl flooring with tile, changed lighting fixtures, updated appliances, replaced outlets, installed undercabinet lighting, and swapped out tile countertops for granite. We have done a lot of the work ourselves. It has been a fun, challenging, and educational experience. One (of many) of our learning lessons game with installing the tile backsplash. We were tired and up against a time deadline. We weren’t paying as close attention to the project details as we should have been. 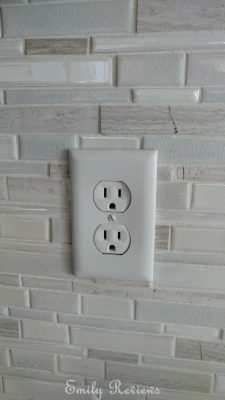 We realized after installing all of the tiles, that we had forgotten to pull the outlets out of the walls, to allow for the extra height of the tiles. At that point, we had two options, rip the tiles off the wall or figure out a way to cut the tiles. We decided to find a way to cut them. 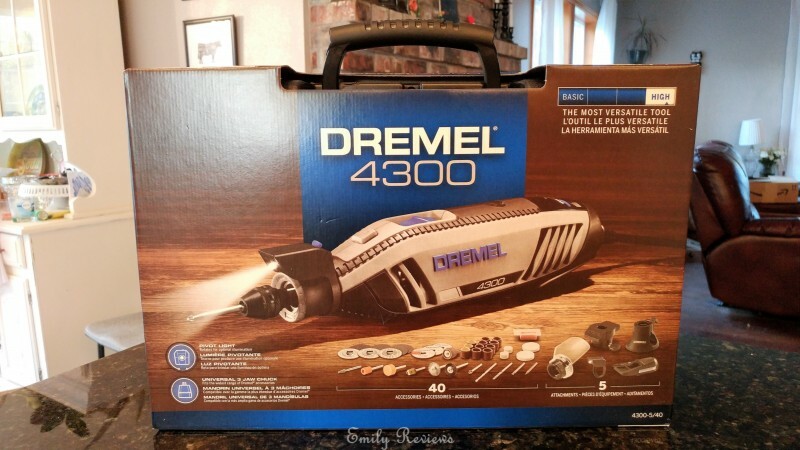 Earlier that week, I had received a Dremel 4300 for review. I ran to my office and opened the Dremel case. After reading the included booklet, we found the best accessory for cutting tiles. It took a little bit of time, but the Dremel was the exact tool we needed! 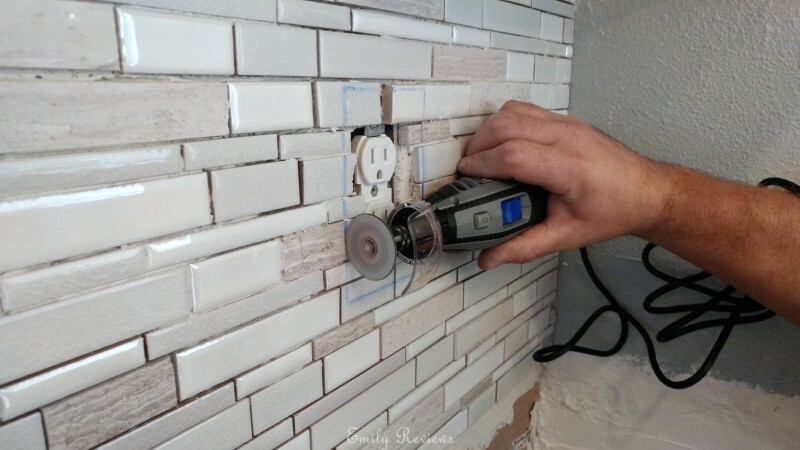 We were able to cut the tiles, pull out the outlets and install the outlet covers. Whew! I look forward to completing more DIY projects with my Dremel 4300! Buy It: Please visit the Dremel website to see the great selection of products they offer and convenient shopping locations. Connect: Don’t forget to follow Dremel on Facebook, Twitter, and Pinterest for the latest product announcements and special offers. I have a Dremel, which I use for hobbies! Hubby has a Dremel and LOVESi. It is amazing what all he has used that tool for. I highly recommend if you have a husband, wife or know someone who is handy and they dont have one, consider it. They are super nice to have around, and almost every disc or attachment is available to replace when you need to. This is awesome I would love to get one, we always loose tools with this if you loose one you loose them all. 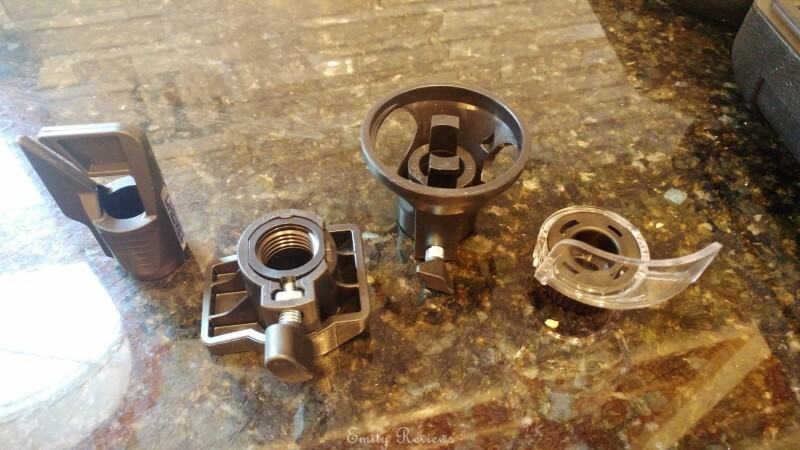 I love Dremel tools…. not matter which ones. I can hold them in my small hands. I love to piddle around the house and shop with them. Multipurpose is so correct!! I cannot believe that some people DONT own a dremel tool!! This is something we could not live without!! The uses are seriously endless!! I could definitely use one of these for my around the house projects! This is such a handy tool to have, you can do SO much with one. 🙂 And I love that it comes in it’s own case! I have heard of this but wasn’t sure of what it’s used for. Thanks for sharing! I really like the tile in the picture above – so pretty! This is awesome! I love that it comes in 40 accessories and has so many functions is one tool! This is definitely a crafter’s dream gadget! I had a Dremel that got lost in a move. I really miss it and need to replace it. I consider it money well spent I used it for everything in our home and even used it when i did my own diy acrylic nails, possibly not brightest or best idea lol. I really need one of these. there are so many things that it would be useful for. I have always wanted a Dremel. It does so many things that make DIY projects so much easier to complete and makes them look so much more professional. I just found some pins yesterday on Pinterest with crafts that can be done with a dremel. There were pretty stones that they put designs on that were really neat!